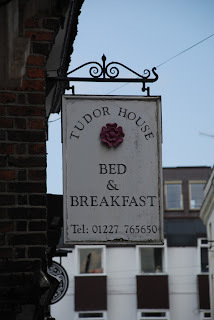 As I walked down Best Lane I saw this sign for a B & B and thought of you. B&B stands for Bed & Breakfast. It is like a hotel but doesn't serve dinner, just breakfast. It is usually cheaper than a hotel although you can find some luxurious ones that are pricey. I'm dying to come and stay there!